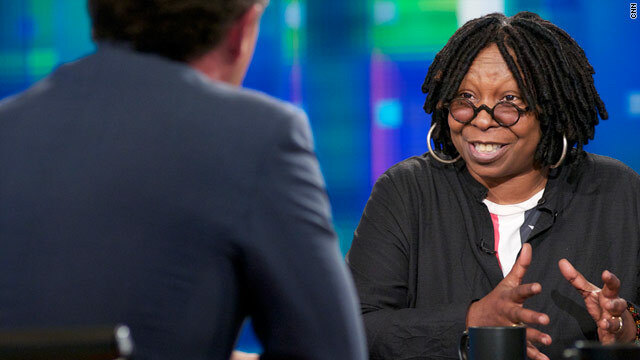 Actress, comedianne and talk-show host Whoopi Goldberg is Piers Morgan's guest on Wednesday night at 9 ET. Says she wasn't in love with her 3 husbands and got married to "feel normal"
"View" co-host is the producer of a stage version of "Sister Act"
(CNN) -- "I only really have one really major regret," Whoopi Goldberg tells CNN's Piers Morgan. "And it was I had the opportunity to spend a birthday with Sammy Davis Jr., and I didn't." The actress and co-host of "The View" is a guest on Wednesday's "Piers Morgan Tonight." Goldberg said she didn't have an exact reason, other than to lament, "I was young and dumb and -- and he passed like a couple of weeks later. And it devastated me because I thought; you know what, that's what you get. "I just remember that he had been so good to me. And we were really, you know, good friends. And I -- I should have gone." She also called Davis an "amazing performer" who could "do everything." Morgan asked Goldberg whether Davis was the "greatest all-around entertainer that we've seen." "There are maybe three or four, in my lifetime, that were extraordinary dancers and singers and actors and performers," she said. She mentioned Judy Garland, Frank Sinatra and Michael Jackson. The actress also talked about her well-known fear of flying. "I feel like I shouldn't be flying," said Goldberg. "I should be rolling in my bus." She said her fear was instilled nearly 30 years ago when she witnessed a mid-air collision while standing on a balcony in San Diego. The actress said that what frightened her so much was that "the people on the plane were aware that they were in some danger." She said she particularly fears for people "who see something that they're not sure they're going to be able to live through." "And so I -- I just -- I -- that's what stayed in my mind," Goldberg said. "Because I'm a visualist. So if I see it, it lives in my brain. So I always see it." She said her fears were somewhat alleviated by a course offered by Virgin Atlantic that helps individuals work through issues surrounding fear of flying. For decades, Goldberg traveled back and forth from New York to Los Angeles via private bus. With two drivers, she was able to arrive on the other coast in 23 hours. "Some people are meant to fly. And I don't know if I was meant to fly, but I do it now." Goldberg has no choice but to fly in the near future -- she is producing a stage version of her 1992 hit movie "Sister Act." It premieres on Broadway on April 20 and is set to open soon in Vienna, Austria; Hamburg, Germany; and London. Another one of Goldberg's quirks is her self-proclaimed refusal to eat "anything that could be hiding something." She said she doesn't "like anything that has a weird consistency." For example? "Creamed corn. I don't understand the point. "I don't understand sauce, because you could hide stuff in sauce. Like, I like my food naked." Morgan brought up relationships and Goldberg's three marriages. "The first one lasted six years," said Morgan. "The second one lasted two years. And the last one lasted a year." Goldberg responded by saying "I suppose that, you know, you have to actually be in love with the person that you marry. You have to really be committed to them. And I'm just -- I don't have that commitment. I'm committed to my family, you know, and so -- hence, for that relationship has lasted, you know, the longest." Goldberg admitted that she wasn't in love with her husbands and that she married them because she "wanted to feel normal. And it seemed to me that if I was married, I'd have a much normal -- more normal life. But clearly, that's not the case. There's not a good reason to get married. You have to actually want a life with someone through ups and downs. And I -- I just discovered that wasn't for me." She said has been in love only once but would not elaborate other than to say that it was with a man. He's not famous, she's still in close contact with him, but they are just friends -- he's married and had a family with another woman, she said. When Morgan expressed his sorrow over the fact that it never worked out, Goldberg said "lots of other things did. So I didn't do too badly." Goldberg was asked about the recent "Newsweek" magazine report that said she was the most popular host of "The View," and she's more well-liked than Oprah. "Well, I -- you know, I mean I'm thankful," said Goldberg. "I'm grateful. But I don't know really what it means." So is Goldberg a "voice of America in the morning?" "I don't think of myself as the voice of America, but I do think that sometimes I see things from a different perspective, sometimes because of my race, sometimes because of my gender, sometimes because of my experiences."